MATTER OF STYLE What to see, where to go and what to buy this Fall. 49 CULT SENSATION Aquazzura's Edgardo Osorio talks confidence, comfort and the coveted sandals we can't get enough of. 56 IN DEPTH Lily Kwong discusses her latest labor of love—a new podcast that dares to ask women more. 58 A NEW PATH Vogue Mexico and Latin America's Karla Martinez de Salas gives us a peek behind the pages. 60 A GLOBAL FIGHT Team Rubicon calls upon veteran volunteers to aid those impacted by natural disasters. 62 HIGHER CALLING A Marine Corps veteran takes action off the field, improving the lives of thousands of servicemen. 64 CAUSE & EFFECT With philanthropy in her DNA, Amoryn Engel has become a fundraising matchmaker. 66 STAR OF INDIA Nita Ambani is a philanthropist at home and a cultural ambassador abroad. 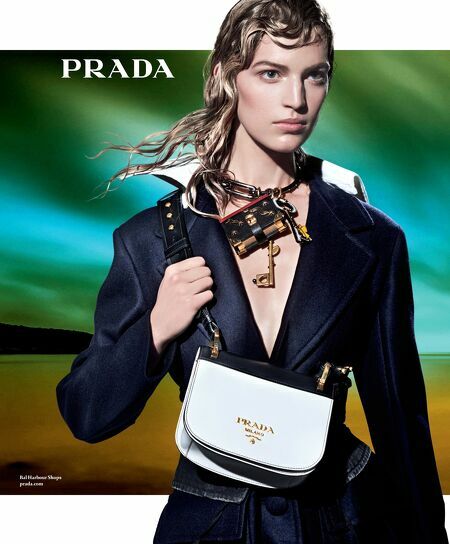 68 IT'S A MUST Temptations run high this Fall, with a season loaded with covetable accessories for men and women. 73 HARLEM REJOICES Chef Marcus Samuelsson cooks up style and savor in his latest release, "The Red Rooster Cookbook." 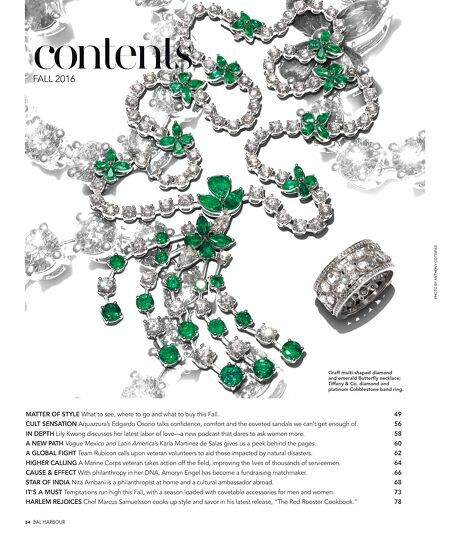 78 contents FALL 2016 34 BAL HARBOUR PHOTO BY ANTHONY COTSIFAS Graff multi-shaped diamond and emerald Butterfly necklace; Tiffany & Co. diamond and platinum Cobblestone band ring.